After a crazy and tiring day in Jerusalem, Israel walking around the city for almost ten hours visiting the museums, government buildings and the Old City (more on this later), I had a sound sleep on “day zero”; woke up with a fresh and relaxed mind and headed out for an early start at 8am. After a quiet breakfast and coffee at a cafe right across the hostel on Jaffa Street, I took the tram from Jaffa City Center station on a 10-minute, 3-station ride to the Central Bus Station. The tram tickets cost ILS 6.60 for a single ride and can be purchased at the tram station. Expect long lines for security check at the entrance of the central bus station, and it can take a while especially if you’re traveling with big bags. The officers will make you open the bags and just swipe their hands through them before letting you go. 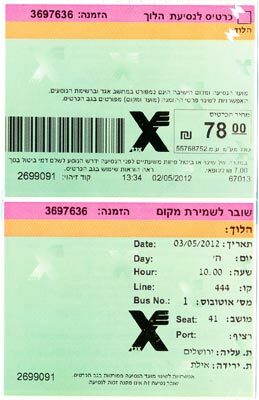 As recommended by the hostel staff, I had booked the bus ticket to Eilat a day in advance. After reaching the central bus station in Jerusalem, I headed to departures on the second floor and the bus #444 arrived at Terminal 4 just 10 minutes before the 10a.m.-scheduled departure. I never thought of this before, but was lucky to get the seat #41 – next to the window and on the left side, which makes it on the side of the Jordanian border when driving south from Jerusalem to Eilat. While booking bus tickets from Jerusalem to Eilat, ask the staff at the ticket counter if you could get a seat that is on the left side of the bus and preferably a window seat. That way you’d be on the side of the Jordanian border most of the time and the views of the Dead Sea are spectacular along the way. The bus takes about 4.5 hours to reach Eilat, including a 20-minute stop for snacks. I had informed the driver to stop at Eilot (the ‘o’ is different from ‘a’ in Eilat), which is a few kilometers before the city of Eilat. 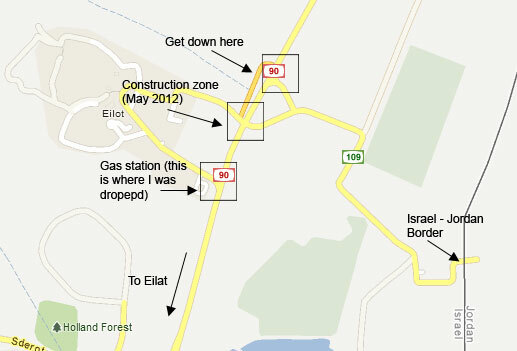 Because of some construction work going on at Eilot, I was dropped at a gas station ahead of the intersection of freeway 90 and road 190; and walking to Road 190 was not an option as I would have to walk on the freeway 90. Having to pay ILS 20, I got into a cab at the gas station and after a quick 10 minute ride, I was at the Jordan border. Make sure to inform the driver to drop you at the intersection of Freeway 90 and Road 190. Once at the intersection, it’s a 20-30 minute, 1.5 kilometer walk to the border. But walking in the scorching heat of the desert and less than a mile of walking may not be a good idea, so a better option is to get down at the gas station just ahead of the intersection, from where you may find a cab, pay ILS 20 and head to the border. This is a gas station outside of the city so only cabs that stop by for gas may be available. Visitors exiting Israel at the Aqaba border must pay an exit fee of ILS 103 and go through the customs window to get an exit stamp. This is where I entered Jordan. Got over to the visa office, which was lined with tourists entering Jordan, I was at the window in about 5 minutes. The officer asked me basic questions like why was I visiting Jordan, for how long and with whom – all this while processing my visa. Visitors entering Jordan at the Aqaba border must pay JOD 8 as entrance fee (cash only), but I was told “you’re Indian, so you go free”! With a visa stamp for 15 days and another 5 minute walk, I was at the taxi border. A cab ride to the Aqaba city center will cost JOD 10, but our resort was another 15 kilometers away from the city center at the South Beach, so the cost for the cab ride was JOD 20. Even though you don’t have any options to go from the Aqaba border to the city center, other than the taxi, always negotiate your costs politely and confirm if the set price was for per person or per ride, if you’re more than one person traveling. If you decide to form a group to take the cab to the city center, make sure to talk over before exiting the border gate; and pretend to be best friends before leading up to the cab drivers. A 30-minute cab ride through the city center, I was at the Red Sea Dive Center (read review) at the South Beach. This place is in the middle-of-nowhere and an uphill walk from the beach. This area is called the “Diving Center Village”, which most cab drivers recognize as. There are a few resorts and diving centers here that offer cheap accommodation and scuba diving lessons (or snorkeling, if you prefer). It was 34C (93F) outside and after checking-in, I went for a swim in the beautiful and clean pool of the resort. A few laps after, headed out to the beach for a walk and watched the sunset across the Red Sea. Darna restaurant and Resort is right across from the beach, at the entrance of the Dive Center village. Had Jordanian dinner at the restaurant and called it a day! Note: All values in USD, unless otherwise mentioned, are approximate and based on the exchange rate of USD 1 = JOD 0.75. Each cost is for one adult. Crossing border from Israel & day in the coastal town. Diving in Red Sea & day in coastal town. Traveling from Aqaba to Wadi Musa & day there. Visiting capital city of Nabataeans. Visiting Bedouin village & Wadi Rum desert. Traveling from Wadi Rum to Amman via Aqaba. Mosaics, religious site & lowest point on earth. Ancient city of Roman ruins.